A Kirkland couple opts for reconstruction over destruction. Using windows of all sizes, architect Ben Trogdon lent the midcentury home a modern appeal and created exciting new vistas to its stunning surroundings. LOOK CLOSELY, and the one-story rambler is still there. 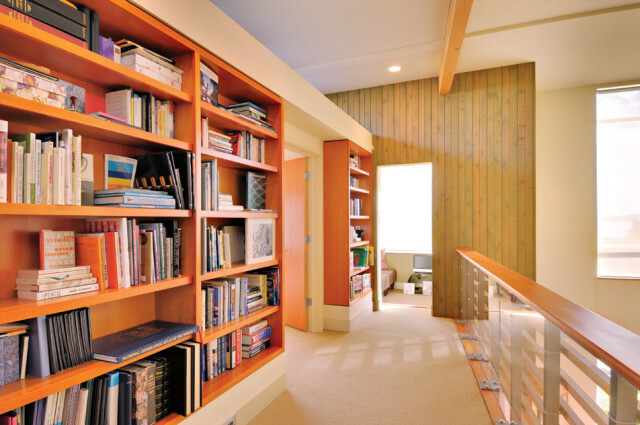 In fact, if you hold up a “before” photo of the house for comparison, you can easily identify the original bones of Brad Weed and Susan Pappalardo’s radically transformed Kirkland home. Early in their married life, the couple, both computer software and graphics professionals, purchased the plain brick structure—the kind of cartoonishly simple, single-story dwelling that children sketch by topping a rectangle with a triangle. Cramped for space and encumbered with a demeanor as sober as a drill sergeant, the 1948-built house wasn’t going to win any beauty contests. Often, when people of means discover such a construction atop a desirable piece of property—in this case a breezy double lot on a suburban hillside overlooking Lake Washington—their next move involves a wrecking ball. Weed and Pappalardo, however, recognized an armature on which they could build “a good first home,” located in an area they enjoyed for its neighborly cadence and proximity to the town center. When improvements became financially feasible, the couple shunned the idea of demolishing the place to start from scratch and instead approached architect Ben Trogdon to guide them in a remodel. The whimsical blobs composing artist Bryan Smith’s Jackaroo juxtapose with the sharp edges of the living room fireplace and furnitures. To create more space, Trogdon articulated the remodeled structure like a weekend vacation caravan; new rooms emerged from the old ones, as if he had unhinged the roof and facade to reveal tentlike hatches that had been collapsed and concealed within for decades. Awakened to their surroundings through numerous glass apertures, the new walls expand in every compass direction in shades of jade, custard, and moondust gray. Large patchwork sections of the old brick carapace remain, now woven into the new and improved one, and painted the elegant, deep gray color of raw coal coke. 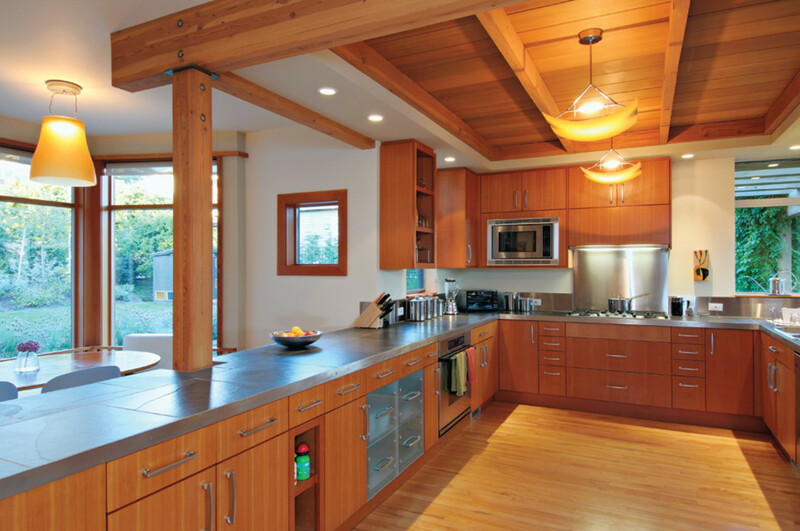 Fir cabinets in warm hues offset the kitchen’s sleek stainless-steel appliances. Daylight flows through a series of loosely defined ground-floor rooms, painted a warm, sun-infused white that washes through the living area, dining alcove, and kitchen. Here, instead of walls, clusters of furniture define the spaces in which all action—particularly that of the inquisitive toddlers—stays comfortably public. 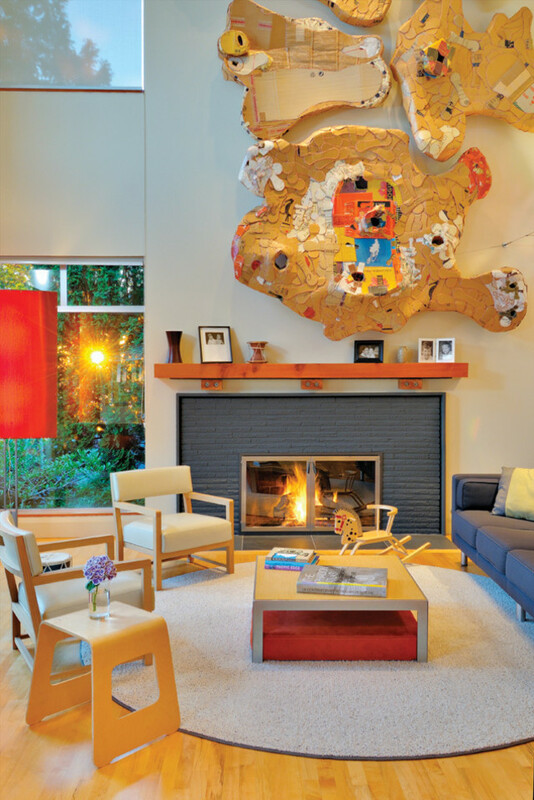 The double-height living room, informally composed and as breezy as an aviary, showcases a composition of hand-stitched cardboard by Seattle artist Bryan Smith. Its bubble-gum-squashed-against-sidewalk shapes cover the high wall in a fungal meander over the original fireplace, which is preserved, painted, and framed like a formal work of art, in stark contrast to the composition above. At the opposite end of the house, black slate countertops in the kitchen contrast with toasted orange, vertical-grain fir cabinets and echo the visual weight and color of the hearth. A grove of laminated fir posts and beams traces the lines of the original foundation and supports the newly added second story for private quarters above. An exposed upstairs hallway lets parents keep a close eye on toddlers downstairs. With their palette of soft natural hues and newly added windows to wash out the shadows, the top-floor bedrooms feel like airborne outposts. The effect is heightened when you walk down the hallway across a suspended diagonal catwalk, open to the living room below, to a small, sunny day room at the other end. Resembling a tree house held aloft above the front door, the room becomes, for the children, a strategic fort from which to spy on neighborhood goings-on; for the parents, a quiet library with a prospect to the lazy bustle of the lake. Ben Trogdon Ben Trogdon Architects, 2724 NE 55th St, Ravenna, 206-343-9907; www.bentrogdonarchitects.com. Green (color match number 9-05-098), black (08A483), and yellow (9-05-096) Sikkens Rubbol by Sikkens, available at Seattle Paint Supply, www.seattlepaint.com. Blue (08A975) Moore Life by Benjamin Moore, available at Bellevue Paint and Decorating, www.bellevuepaint.net. Entry Hall Antique log bench from Glenn Richards Asian Furnishings and Antiques, 964 Denny Way, South Lake Union, 206-287-1877; www.glennrichards.com. Kitchen Breakfast tabletop and leg design by interior designer Catherine Farrington, 425-351-6277; fabrication and design details by Stefan Gulassa, Gulassa and Company, 206-283-1810; www.gulassaco.com. Leather bench designed by Catherine Farrington, 425-351-6277; fabricated by Village Interiors, 215 S Findlay St, Georgetown, 206-768-9600. Dining Room Dining table by interior designer Sally Oien, The Oien Collaborative, 2211 22nd Ave E, Montlake, 206-617-8907. Navy Side Chairs from Design Within Reach, 1918 First Ave, Pike Place Market, 206-443-9900; www.dwr.com. Master Bedroom Bed and night table design by Ben Trogdon, fabricated by Seaboard Cabinets (out of business). Midnight Black slate from American Slate Company, www.americanslate.com. Living Room Wall sculpture, Jackaroo, by Bryan Smith, bryansmithvis@msn.com. Fin sculpture by Stefan Gulassa, Gulassa and Company, 206-283-1810; www.gulassaco.com. Master Bedroom Cobble Hill headboard in Light Green by Donghia, available through -Susan Mills Showroom, Seattle Design Center, 5701 Sixth Ave S, Georgetown, 206-682-6388; www.susanmillsshowroom.com. Tongue-and-groove flooring in northern sugar maple, finished and installed by Greater Seattle Floors, 114 S Findlay St, Georgetown, 206-763-7004.